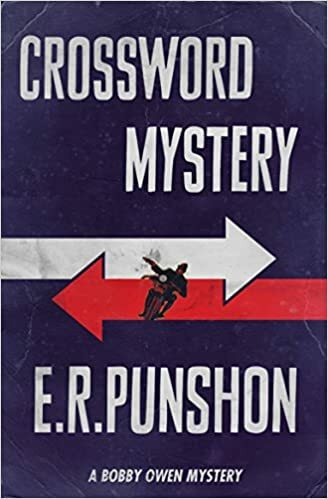 I am, alas, rapidly losing my enthusiasm for E. R. Punshon’s Bobby Owen series of detective stories. I was delighted with the first entry in this classic 1930s English series, featuring young policeman Bobby Owen who, under the wry mentorship of his superior, Superintendent Mitchell, finds within himself the makings of a good crime solver. What I liked about the first book, Information Received, was the emphasis on the characters of Bobby and Supt. Mitchell, an interesting and amusing interplay of minds. Sadly, the second book, which I reviewed further down the page here, had less of that. And this one, Crossword Mystery, though better in that regard, is still less a character story than a puzzle story. And the motivations and behavior of the criminals, as in previous books, are more like melodrama than a modern mystery story. In this story, Bobby is sent to the majestic seaside home of Mr. George Winterton, an economic eccentric who’s writing a book on the Gold Standard. His brother, who lived across the bay from him, drowned recently under suspicious circumstances, and Mr. Winterton fears that it was murder, and that he himself is next. In between writing sessions, he’s working on a crossword puzzle about which he’s very secretive, and which proves to be the key to the mystery in the end. The book’s all right. Well enough written, and nothing objectionable. But the story dragged for me, and the climactic scene was not very credible in a realistic story. I’m not sure I’ll continue following Bobby Owen’s career.